Window shopping has gone virtual. Are you ready? 36% of the top 100 brand sites in the UK have not been optimised for mobile and yet we’re seeing window shopping going virtual. 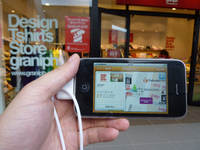 So if your mobile site isn’t ready, you’re missing out on the first stage of the buying process. Even if shoppers don’t trust their touch-screen devices enough to make the final purchase via a mobile connection, they are definitely using it to browse, share and fill up their baskets. Conversion optimisation is great, but to some extent it works on the premise that customers know what they’re looking for. Ok, checkouts, calls to action, merchandising should always be finessed, but optimisation is a means of squeezing more from specific intent. But what if moving the customer towards the magpie psyche is the future of selling online? A new ecommerce model is emerging and it works on the premise that customers can be encouraged to ‘bag at will’. All retailers need to do is surface rarer, quality products that are socially proven and most importantly look great. Australian consumers are shying away from international online retailers if the recent NAB Online Retail Sales Index is anything to go by. Domestic retail accounted for almost three-quarters (73%) of total online sales in Australia in January 2013, and domestic online retail sales saw a higher year-on-year growth than international, rising 28% vs 25%. It seems China has some of the keenest online shoppers in the Asia-Pacific region, with Chinese consumers more likely purchase online than any other APAC country. A new Mastercard study measured consumers’ tendencies to shop online between November and December 2012 and found that Chinese internet users shop online the most, registering a score of 102 on Mastercard’s Index for 2012, a figure that is up four points on the year prior. According to the report, one of the main reasons for this rise in online shopping popularity in China is due to increased consumer confidence. Of those surveyed, only 21.4% felt unsecure when shopping online, down from 32.8% in 2011 and 35.3% in 2010. 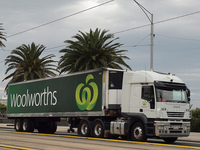 Woolworths has been named the top retail brand in Australia for the second year running, beating out supermarket competitor Coles by almost a billion dollars. Interbrand’s 2013 Best Retail Brands report, which ranks the top retail brands around the world by value, placed Woolworths brand value at $4.57 billion, an increase of 9% on the year prior.